Mobican is a family owned company whose mission is to offer high quality, functional and affordable product lines. Their European origins contribute to the creation and manufacturing of superior quality Contemporary and Scandinavian influenced furniture. They specialize in bedroom furniture, dining room sets as well as audio video modules. The entire process, design and production, is done locally in their facility in Saint-Jean-sur-Richelieu, Québec. The utmost care is given to each step of the production process. 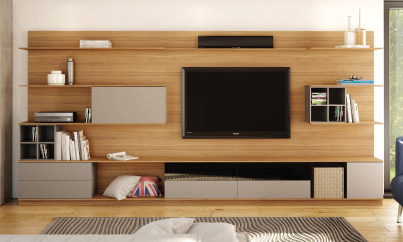 The wood is carefully selected for its exceptional grain patterns and combination of colours. They produce furniture made of walnut, cherry, white and red oak, maple and teak. During the manufacturing process, it is assembled to create specific lines or patterns. They use the highest quality European hinges and drawer slides to offer the best possible product. *Mobican products are only available at our Burlington location.